New in Version 1.5, IES TM-30-15 Light Source Color Rendition. 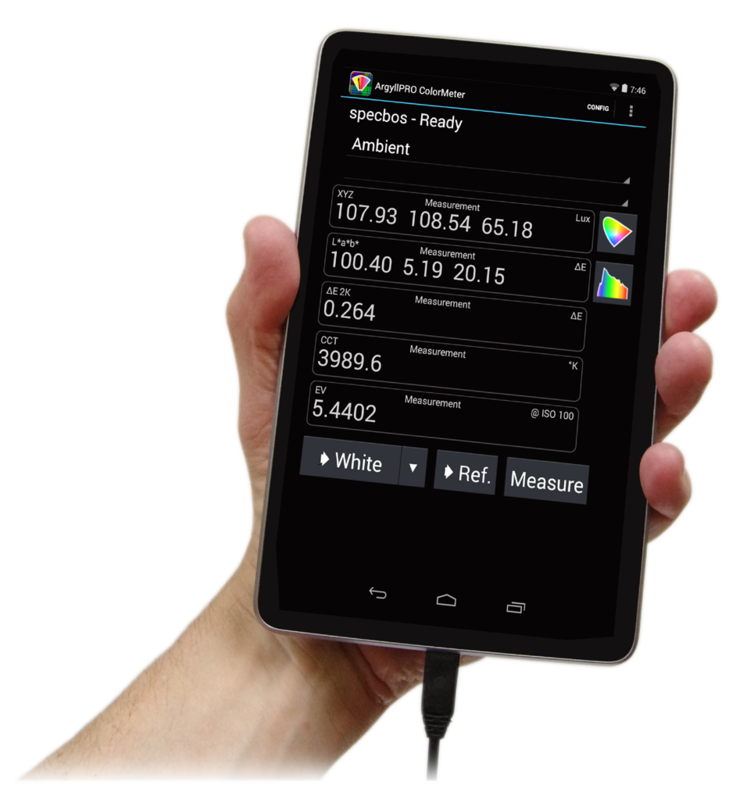 ArgyllPRO ColorMeter is an Android application for Tablets and Phones, that lets you use all your USB connected color measurement instruments on the go. If you need to measure light or color in Printing, Photography, Lighting, Graphic Design, TV, Film or Video, then you will want to check it out in the 2 Minute Overview + Guided Tour Video. For complete details, please see the ArgyllPRO website. ArgyllCMS is an ICC compatible color management system, available as Open Source. It supports accurate ICC profile creation for scanners, cameras and film recorders, and calibration and profiling of displays and RGB & CMYK printers. Device Link can be created with a wide variety of advanced options, including specialized Video calibration standards and 3dLuts. Spectral sample data is supported, allowing a selection of illuminants observer types, and paper fluorescent whitener additive compensation. Profiles can also incorporate source specific gamut mappings for perceptual and saturation intents. Gamut mapping and profile linking uses the CIECAM02 appearance model, a unique gamut mapping algorithm, and a wide selection of rendering intents. It also includes code for the fastest portable 8 bit raster color conversion engine available anywhere, as well as support for fast, fully accurate 16 bit conversion. Device color gamuts can also be viewed and compared with a modern Web browser using X3DOM . Comprehensive documentation is provided for each major tool, and a general guide to using the tools for typical color management tasks is also available. A mailing list provides support for more advanced usage. Argyll is a collection of source code that compiles into a set of command line tools, licensed under an AGLP license. Argyll also includes a general purpose ICC V2 profile format access library, icclib, and a general purpose CGATS file format I/O library. Also hosted here, is DPS a "Demo Print System". This is an inkjet printer driver framework, currently aimed at driving the Epson R1800 printer. This is under development, and not yet complete. Your continued support is important. Unfortunately programmers and color experts can't live on encouragement and complements alone - they have bills to pay, equipment to keep up to date, instruments to buy, and other financial obligations such as maintaining a roof over their heads and keeping the lights on, just like normal people. Currently it is only your support that will allow me to continue working on ArgyllCMS, rather than having to do something else. So if you find ArgyllCMS valuable, and would like to continue to have technical support, bug-fixes, updates and drivers for new instruments, and support for new technologies, or you appreciate having serious color management available on platforms other than MSWin and OS X, then it's a really good idea to provide some support via a donation that reflects the value it has to you. If you are a casual or hobby user, then something like $5 - $100 may be appropriate, depending on how deep your pockets are. If you are using ArgyllCMS in your business, an annual donation, of (say) 5-20% of the cost of the commercial software you have not had to pay for, would make a great deal of difference in ensuring that it continues to be available. If you are distributing ArgyllCMS as part of some other free package, then please make your users aware of the need to support the software that you and they depend upon. If you are distributing ArgyllCMS as part of some other package that you are make money out of (e.g., a commercial Linux distribution where ArgyllCMS is providing a feature that allows Linux to be on par with other operating systems with regard to Color Management), then it would help tremendously if you treated it like other key software you depend on, and make an allowance to contribute a portion of a full time developers salary every year. No contribution is too small - it all adds up. If there is an insufficient level of ongoing support, then there is still a very real possibility that you will return here in 6-12 months time, and find ArgyllCMS has gone. After you have downloaded the source or executables, please read the notes on installing. Please note that some of the Linux packages based on "ArgyllCMS" have been modified in various ways, and may not work exactly the same as what is distributed here. If something doesn't work using such a package, please download the unmodified software from here and re-test before reporting a bug. The best way of getting support in using ArgyllCMS or reporting bugs, is via the ArgyllCMS mailing List, where you will get the benefit of other knowledgeable people being able to help you. You can also email me (Graeme Gill) directly. (See Contact Me below). For Video and TV calibration and Profiling, the AVS Forums. For Film & Video color grading display calibration, Lift Gamma Gain is worth a look. For Camera, Photography, Photo Printing and Display profiling, try Luminous Landscapes. while Forums like Printer Knowledge may be better suited to those at a more hobby level. Coloris by Rémi and Lionel Wetteren. SwatchMate Cube, Part 2 - Can it be improved ?